Dizzying descent. White knuckles the first time I did it, and the second. Looks like a Ford commercial, but it’s just another afternoon in the canyons. 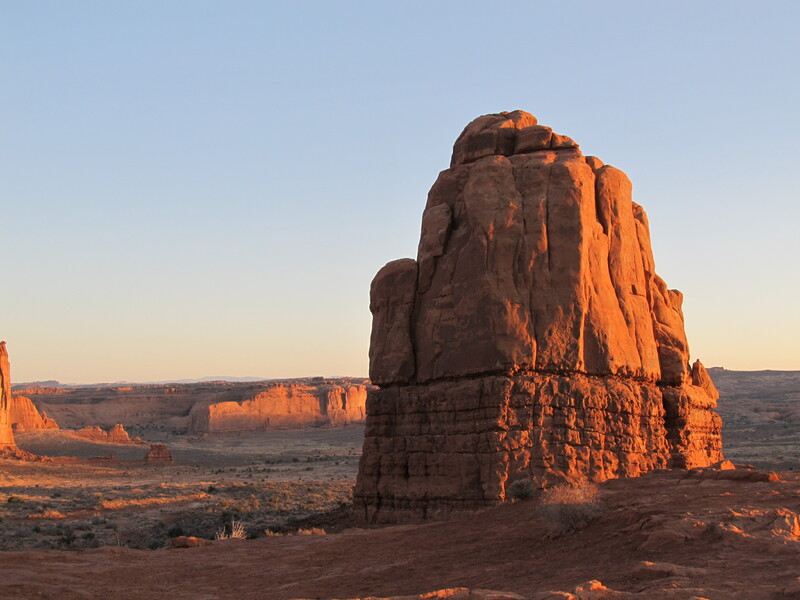 “Walking Rocks” show differential erosion near Musselman Arch. The Goosenecks Overlook allows a view of the Colorado River’s bends as it winds through Canyonlands National Park. The switchbacks that gain the most attention in Canyonlands National Park are the old livestock-path-turned-4WD-road called the Shafer Trail. Dropping over 1000 feet in just a few miles, it carries visitors away from the popular mesa-top viewpoints and crowds. When our friends arrived with a 4×4 truck that enabled us to explore one of the more remote parts of the park for an afternoon, we decided that getting off the beaten path is ALWAYS a good thing. Scheduled to give two outdoor geology programs this morning, I studied the clouds intently. My winter uniform was retrieved from the closet on this blustery May day that SHOULD be nearing 80 degrees but showed no promise of hitting mid-50s. Park visitors, God bless ’em, still come to ranger talks no matter the weather. As I approached my assigned overlook, rain twelve miles off was descending in thick curtains, silently drenching the desert below. Precipitation gives a shimmery appearance that glistens in your heart as much as on the landforms, and I felt momentarily giddy to see my parched park drinking up the gift of water. Shallow depressions in the sandstone gathered the droplets, half inch deep, two inches deep. These ephemeral potholes nurture all living things, from the tiniest of organisms to our largest predators. To see standing water is to receive soul-refreshment. Who doesn’t need that??? Cloud majesty, right out my front door. How many reds can a sunset have? Views from my front porch are never the same twice. Watercolor sunset over the Green River Overlook. Sandstorm sunset creates an illusion of a floating red ball over housing area. The sky changes every few seconds here. The display is breathtaking, every single evening. It is simultaneously mundane and miraculous, always beckoning me to the porch for the last few moments of each day. Apricot and periwinkle, magenta and tangerine, colors of life and delight and laughter, best shared with one you love.